The Second Life Herald recently reported that the IRS issued a ruling that the Electric Sheep Company’s Second Life greeters for its CSI:NY promotion were “employees” rather than contractors, implicating greater tax withholding and reporting requirements and raising questions for other virtual world businesses. The greeters whom ESC employed in Second Life have indeed been ruled as part-time employees by the IRS, so we will take appropriate steps. I actually think that this is an interesting precedent – that part-time workers in a virtual world, and using their own equipment, schedule, and judgment to perform tasks, have been ruled as employees. In terms of scheduling, greeters were able to submit the times they wanted to work, and we worked out coverage accordingly. And yes, appropriate steps will be taken regarding paperwork and payments. We’re fine with this clarification from the IRS; this is a really murky area in US law, and we just want to do the right thing. The economic consequences should not be significant. Virtually Blind interviewed attorney Dave Elchoness regarding the ruling. Elchoness is an employment lawyer, the founder of VRWorkplace, and the Executive Director the Association of Virtual Worlds. Virtually Blind: What does the IRS ruling mean in layman’s terms? Dave Elchoness: Right now, all we have are the comments of Electric Sheep on the IRS’s decision. There is no published ruling, to my knowledge. Based on the company’s comments, it appears that The Electric Sheep Company retained the services of some greeters in Second Life as part of its CSI event last year and treated the greeters as independent contractors rather than as part-time employees. The IRS has apparently ruled that the independent contractor classification was improper. IRS rules require companies to withhold income taxes, withhold and pay Social Security and Medicare taxes, and pay unemployment tax on wages paid to an employee. The same requirements do not apply to independent contractor relationships. The IRS can impose fines, penalties, and back taxes for misclassifying an employee as an independent contractor. Whether someone is an independent contractor or an employee depends on a number of factors, generally having to do with the degree of control the company has over the individual’s work and its relationship with the individual. If the degree of control is high, the relationship is generally considered employment. Here, Electric Sheep indicates that the greeters used their own equipment, set their own schedules and exercised a degree of judgment in performing their roles. These facts suggest a contractor relationship. That said, we do not know the IRS’ entire rationale in deciding that the workers were actually part-time employees. VB: Does that mean that U.S. business owners need to start keeping real life data, like proof of employability and identity on all dancers, bouncers, greeters, receptionists, and other employees in Second Life? DE: Not in all cases, but generally, if an avatar is providing a service, yes, this does make good sense. 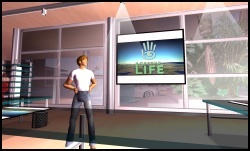 Business owners need to understand that real life laws apply to virtual world activities. Think of it this way: if an activity taking place inside a virtual world looks like real life work e.g. greeting avatars to a sim, or building a facility for someone, courts and agencies may apply real life wage laws, tax laws, and other rules and regulations related to work. Seek legal counsel familiar with virtual worlds to help you through this potential maze. VB: What do you think this means for virtual world businesses and economies in the long run? DE: It means that the human resources function in companies and the practice of employment law will be more complex. Consider that in the past most workforces were local and one set of laws applied. Over the past twenty years, managing workplaces has become somewhat more complex due to global companies, but still, workers in different places did not work as closely together as workers in the same physical location. However, with virtual worlds, this will all change. We can work ‘together’ as if in person, regardless of where in the world we are. Fifty employees in a virtual workplace could physically be at their desks in 50 different countries. But 50 or more different wage laws, 50 different tax laws, etc. will apply to people working ‘in the same environment.’ Think of the management difficulties along with the conflicts that could arise when a US employee making $40 per hour works on the same project, in the same space, as someone elsewhere making a fraction of that. VB: Although the Electric Sheep Company is a significant, mainstream content-creation presence in the virtual world and regularly partners with major brands, the ruling could have broader implications for “microemployment” in virtual worlds, where users typically are paid by in-world businesses in the local currency (Linden Dollars in Second Life), and are often paid at rates far below federal minimum wage. For example, Bacchus, a Second Life club, is currently advertising a “Security” position paying 50 Linden Dollars — roughly $0.18 — per hour, plus tips. Is there any good legal argument for the protection of this kind of employment, where the payment almost by definition is secondary to the experience? DE: A few comments: First, whether the activity is ‘work’ or ‘employment’ will most likely be determined by the jurisdiction where the user is physically located. Second, any applicable minimum wage will also be determined by that jurisdiction. So available arguments will depend on the jurisdiction. That said, I think the business’ argument is probably that what is being referred to as ‘work’ is really game play or simulation. Although, to my knowledge this is an entirely new issue, I suspect that this argument would be most viable when (1) the business is contained entirely within the virtual world, as opposed to a virtual world extension of a real life business, (2) the business appears to be designed for fun or the game rather than for profit, (3) the ‘work’ activities are unlike or dissimilar from real life work or more like game play or simulation than work, and (4) the individual performing the activities is doing so on his own time, can come and go as he pleases, and is not subject to control by the business. You can see that this is a highly fact dependent analysis. So, seeking the advice of legal counsel does make sense. VB: Anything else you can add to this? DE: Virtual world enthusiasts from businesses to individuals love virtual worlds for their immersive quality. In virtual worlds, you tend to feel like you’re ‘with’ others in a ‘place’ rather than communicating over a network with a tool. That’s what’s magical about them and why they will, over time, largely eliminate the challenges of physical distance. That said, we cannot fool ourselves into thinking that real life laws do not apply to virtual worlds. We would never question whether working over the telephone counts as work. The same applies to virtual worlds technology. Photo credit: The generic “employee” picture at the top of this article was taken at ThA OFFiCe SToRe in Second Life. Quite interesting, and to read an actual communication between such an employee and Electric Sheep Company, and how the ECS views its “employees”, i.e., as gloaters, take a look and this little email communication between one of its “gloaters” and the ECS trying to ferret out and resolve the IC/EE issues and the unfortunate tax consequences suffered by the employee…..
Wordpress may have eaten the link to Marc’s post. Here it is.